THE STORY - Together, they're 342 years old. They're in their seventh decade of cutting-edge, epoch-defining performances on stage and on screen. Funny, smart, sharp, competitive, tearful, hilarious, savage, clever, caustic, cool, gorgeous, poignant, irreverent, iconic, old, and unbelievably young. Special friends, special women and special dames: a chance to hang out with them all, at the same table, at the same time, and enjoy sparkling and unguarded conversation spliced with a raft of archive. THE GOOD - A fascinating peek at the interior lives of some of the most influential actresses who made the transition from stage to screen in the UK. THE BAD - A fairly shallow look at the experiences of its subjects that never allows us to go beyond what there is to offer with the initial interviews. ​​​It’s not usual for actors to become more reclusive as they age, or for the press to lose interest in older talent. “Tea With The Dames” offers an unprecedented glimpse into the lives of 4 actresses all of whom have been in the theater and film industry for more than 60 years. They also happen to be close friends as well as being some of the most proclaimed people in their field of work. 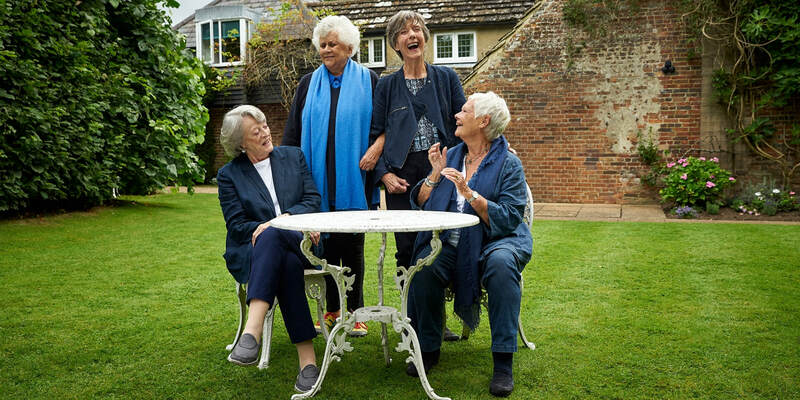 Dames Judi Dench, Maggie Smith, Eileen Atkins, and Joan Plowright are the focus of this charming documentary and each one is able to provide a different perspective on what it has been like to be part of the entertainment industry during a time of immense growth. Every so often some of the most successful British actresses in the world get together to gossip, share their stories and discuss the current state of the world of film. In “Tea with The Dames” they allow a documentary crew access to one of their get-togethers not only to film their interactions but also to ask questions of the 4 famous women. The majority of the film is caught up in allowing the women’s stories to unfold naturally, from their early exploits on the stage to their most famous roles as well as their love lives and times off camera dealing with the personal issues everyone must face. Having known each other for decades, the women themselves are the best interviewers in the film as they have no compunctions about asking difficult question of each other or discussing issues that no interviewer would dare bring up to such a distinguished subject of a certain age. With a combination of current interview footage, historical interview and scenes from film and plays, “Tea With The Dames” attempts to provide a wide-ranging view of these 4 women who were heavily involved in the British acting scene for more than half a century. Each of them contributes something special, from Dame Judi Dench who got her start in classical theater and has now taken up such iconic roles as Q in "James Bond" to Dame Maggie Smith who is probably the most well known in America now for her role as Professor McGonagall in the "Harry Potter" franchise, they are each able to offer a story that sheds light on how the film industry became what it is today. With its signature British wit and an unrelenting desire to allow the 4 women at its center to be open and honest about themselves and their lives, “Tea With The Dames” can be a fascinating experience for those interested in what it has to offer. But if you are looking for something more akin to a tabloid tell-all you will be disappointed. There are no deep secrets revealed or harrowing events recounted, instead the film is more like a series of gentle reminiscences of the past and how it shaped the lives of those who are telling these stories. While it feels incredibly honest what is most clear by the end is that each of these women deserves their own documentary to really explore their lives as actresses. “Tea With The Dames” is an excellent introduction to the careers of these 4 women, but unfortunately it isn’t able to devote the time necessary to give a full picture of its subjects lives and contributions to the world of film and theater.